1,235 players arrived for Khans of Tarkir Sealed Deck, giving way to 148 to draft on the second day and a star-studded Top 8 to cap it all off. In his second Grand Prix Top 8 in the calendar year, Gerard Fabiano again found victory in Limited, earning the title of Grand Prix Baltimore champion. Entering Day 2 needing to win out both of his drafts, Fabiano found his footing with a powerful Sultai deck to close out his finals against David Foster, finalist at his second Grand Prix ever. Along the way, Fabiano stopped the hyper-aggressive deck Pro Tour Dragon’s Maze winner Craig Wescoe as well as twenty-second-ranked Ben Stark’s white-black Warriors (who had to hurdle past twentieth-ranked Josh Utter-Leyton’s Temur deck). With the era of Khans of Tarkir Limited closing – Fate Reforged is coming up quickly – the game’s greats continue to power out victory in what many call the greatest Limited format in years. The 2014 year is closing out but the first Grand Prix season of 2015 is just heating up. Join us in the first weekend of the new year for a double Standard weekend at Grand Prix Denver and Grand Prix Manila! From the 1,235 attendees that battled through nine rounds of Khans of Tarkir Sealed Deck, just 148 have returned to pick their way to destiny at Grand Prix Baltimore. While the forty-card count of the decks will remain the same, the contents shift to what players choose for themselves. The echoes of “Draft!” will ring twice before the Top 8 is determined. Leading the way entering the day are five undefeated players from Day 1: fifth-ranked Reid Duke, fresh off his rallying performance at the World Championship; Craig Wescoe, champion of Pro Tour Dragon’s Maze; Andrew Cuneo and Chris Pikula, long-time players finding their resurgence; and David Foster. Whoever emerges from their first draft pod with a 3-0 record will find points, and positioning, for the Top 8. Join us at 10:30 AM Eastern at Twitch.tv/ggslive with Marshall Sutcliffe, Randy Buehler, and Gabe Carlton-Barnes to watch Khans of Tarkir Draft unfold in the race to another Grand Prix champion! The end of the 2014 Grand Prix line in North America is here at the heart of the Chesapeake Bay in Baltimore, Maryland. 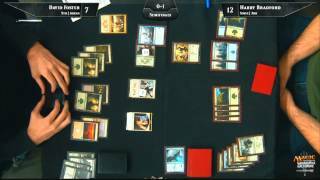 1,235 players arrived to battle in Khans of Tarkir Sealed Deck, looking to unlock Day 2 achievements and return for Draft. Mana bases were made. Tricks were played. The knowledge and skill of competitors was put to the test. 148 players made that cut for Day 2 and will pick their way to destiny tomorrow. Some managed to find perfect in the cozy field of contenders. Fifth-ranked Reid Duke got wealthy, in the most Villainous of ways, to achieve a perfect 9-0 record. Longtime players Andrew Cuneo and Chris Pikula were back in form with 9-0 moves to Day 2, as was Pro Tour Dragon’s Maze champion Craig Wescoe. David Foster rounded out the 9-0 undefeated players. 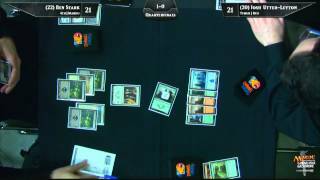 Others, such as first-ranked Owen Turtenwald, Grand Prix New Jersey winner Brian Braun-Duin, Jamie Parke, and Pro Tour Khans of Tarkir Top 8 contendor Mike Sigrist scrapped through the final round to make the cut for Day 2. 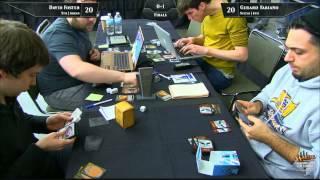 The hashtag for Grand Prix Baltimore 2015 is #gpbaltimore. Join the conversation!